Before coming to Taiwan our friends Dan and Debbie invited us over to watch Bizarre Foods with Andrew Zimmern. One of the bizarre foods he tried was stinky tofu. Stinky tofu in different variations are everywhere, there is a shop just down the road from us (and trust me, when you walk by you can't miss it). So we've tried it a few times - me taking small bites and Jeremiah actually consuming most of a serving. 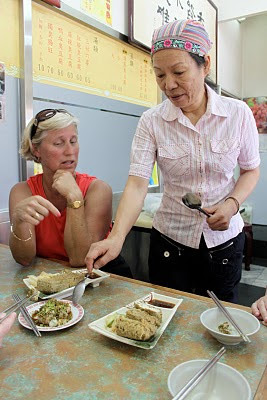 However, the restaurant Andrew Zimmern went to looked to be just about the stinkiest of the stinky tofu you can get. Dai's House of Unique Stink starts at about the 5:00 minute mark. We knew at some point we would make it to Dai's House of Unique Stink to see for ourselves just how bad it really is, and it just so happened that we found ourselves in Taipei with some time to kill when our moms were in town. Lucky them right? Right. Folks, this is the grossest thing I have ever eaten. Think of the worst sewage smell you have ever experienced and imagine that being in your mouth. I thought some of us weren't going to be able to swallow it. We had chasers of dark, strong, juice that we quickly drank but the taste doesn't leave your mouth that easily. Next came the fried stinky tofu and Ms. Wu showed us how to prepare it. Compared to the raw kind, fried was a piece of cake. Smothered in sauce it was manageable. Manageable as in I would probably never again eat it on purpose but if made to I could do it without gagging. Jeremiah rallied and went back for seconds of the raw type, and I think even ate a whole square of the fried one by himself. Now whose ready to try some? The raw one looks delicious on the picture and the fried one looks like a sewage cake. That seriously made me gag a little bit. No thanks. Just stumbled across your blog and this entry! LOL We live up in Taipei. I cannot bring myself to visit Dai's! My husband can't stand tofu in the first place, but I did get him to try stinky tofu at the night markets twice for "research sake" HAHA. Definitely takes an adventurous spirit to try if it's not something you grew up enjoying! Cows and Camels and Monkeys, Oh My!